Background: Soy isoflavones, such as genistein and daidzein, are bioflavonoids found in soy products that are able to interact with various hormones such as estrogen. Epidemiological studies reveal a proper level of isoflavones in diet can prevent many diseases like cancers or diabetes. Therefore, it is important to study the biotransformation and xenobiotic metabolism of soy isoflavones. Methods: A systematic review of published studies was carried out to investigate the characterization of isoflavones and their metabolites, sample pretreatment and quantitative analysis of isoflavones, and the influence of soy isoflavones on drug and xenobiotic metabolism. Results: Aglycones with weak estrogen-like activities are the biologically active forms of the soy isoflavones in mammals. The most recent advances including extraction, purification and detection of isoflavones in soybean and soy products are discussed. The effects of soy isoflavones on drug and xenobiotic metabolism involve in regulation of phase I cytochrome P450 (CYPs) enzyme and phase I detoxifying enzymes expression and activity. At the molecular level, soy isoflavones have proved capable of estrogenic/antiestrogenic with tissue-selective, anti-cancer, antiobesity, anti-oxidation, and tyrosine kinase inhibition activities. 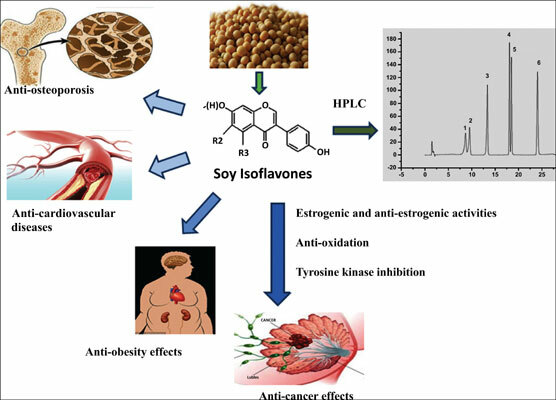 Conclusion: This review summarized different aspects of soy isoflavones and their molecular mechanisms of pharmacological action on xenobiotic, which demonstrated that soy isoflavones can decrease the incidence of many diseases and benefit for human health. However, since the lack of clinical research for evaluation of the proper dosage of intake of soy isoflavones in diet or adjunctive therapy, there is a need for further studies on the selection of doses, biomedical applications and adverse effects of isoflavones for human health. Soybean, soy isoflavones, analysis, xenobiotic metabolism, biological effects, biomedical applications.